Well, a few days to go and today is castle day! Our scenic cruise through the most famous stretch of the Rhine River with no less than 30 castles or castle ruins are found in this short stretch of river valley, the Rhine Gorge – more than anywhere else in the world! But first, another delicious lunch and then we dock in the wine town of Rudesheim, famous for Reisling, taverns and Siegfried’s Musical Cabinet Museum. 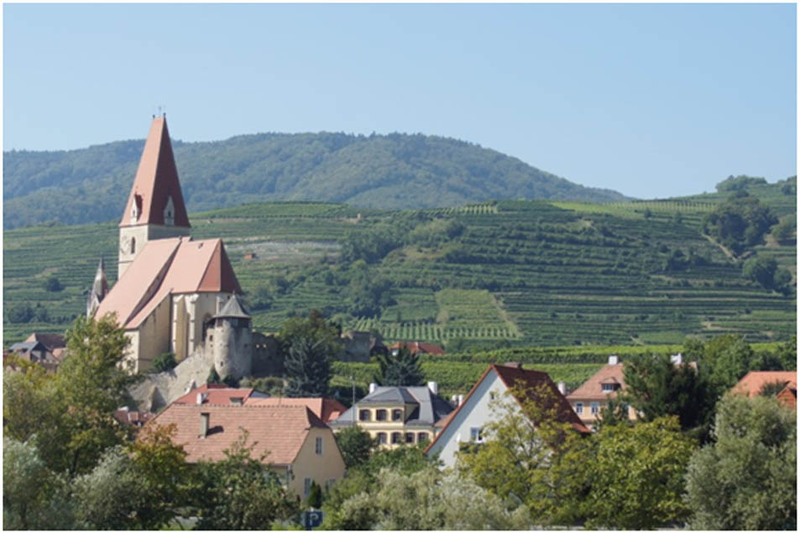 With a small population of 7,000, this small and utterly charming port town dates back to the Romans and is the self-declared home of the famous Reisling wine. Before we are let loose to experience the quaint shopping and entertaining street of Drosselgasse (a short street of only 450 feet but with many restaurants, cafes, shops and traditional wine bars), we had decided to go to the Musical Cabinet Museum. I really went on a whim thinking it would be boring but in fact it was very fascinating. There were some very interesting self playing musical instruments and I was amazed at the “technology” of that era! On the River Rhine, the passion for building castles skyrocketed around the 12th century…every Lord wanted one for himself and while castles cost them a lot to build, they also made money for their owners as each castle would demand custom money from whomever passed, no matter if by land or by water. The Rhine is an international river since it traverses and borders no fewer than 6 countries: Switzerland, Lichtenstein, Austria, Germany, France and the Netherlands! I must admit, the castles were very cool and it remains for me, what the Rhine River is all about and the quintessential image of Germany! This day, despite its wondrous sightseeing so far, is not over. We still have the port city of Koblenz to explore. Koblenz does not have any tours available from the ship, however, our Cruise Manager Dijan has offered to walk around the city and give some commentary along the way. I don’t think he expected 80% of the ship to take him up on his offer…so it was a big group. One of the advances in group tours in recent years has been the introduction of quiet audio devices. This device allows you to hear the group leader through a headphone as he talks about the sights through a microphone and really only the group can hear him. It’s a perfect way to hear what is being said without having to stand beside him. With a group this size, it’s a necessity and it allows you freedom to break away for some pictures, etc without missing a thing. As it happens, there was some sort of celebration in Koblenz that night with a variety of bands and street vendors almost around each corner. It certainly was a party in the streets of Koblenz that night. 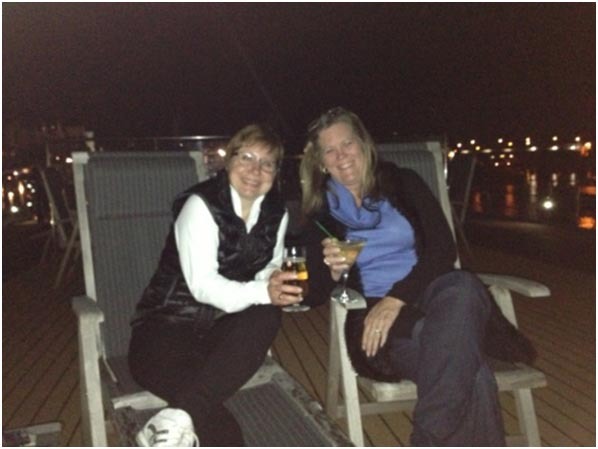 We decided to have a little party on the sun deck of our ship when we got back that night. Saturday, Sept 14 – This morning we enjoyed a pleasant cruise continuing up the Rhine River passing by the remains of the Bridge of Remagen. My WW2 history is a little weak but the railroad bridge of Ludendorf was an important point in the advancement of the Allied forces in Germany across the Rhine. It survived many bombings and there is nothing left of the actual bridge which collapsed during the war after allowing the Allies the crossing point they needed. On both shore sides the pillars of the bridge serve as a reminder of WW2. The key highlight of the day is our stop in Cologne. For us, it’s a chance to visit more relatives! We had 2 cousins, their spouses and one of their children meet us at the dock and take us on a tour of the city. 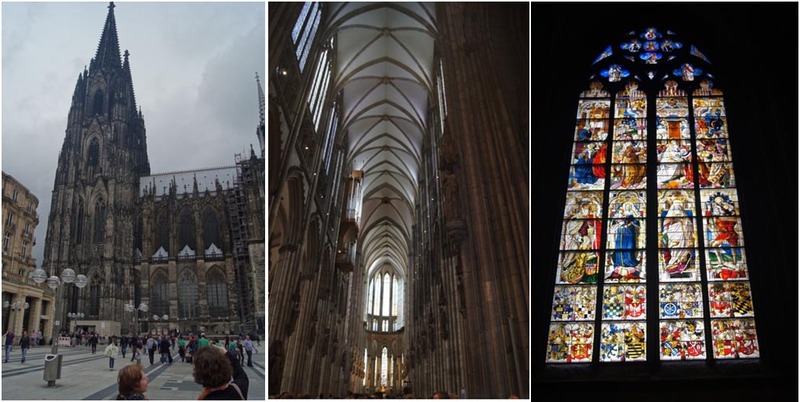 The city’s most recognizable landmark is certainly the Cathedral which is a UNESCO Work Heritage site. We did take in this and some of the other sites of the city, see the pictures below, but the best part of the stop was our time visiting with family. It was so great to see them again and enjoy some time together. In addition to the Cathedral, we through the old town and across a marvelous bridge. The custom of couples dedicating their love with padlocks on the railings was very evident and perhaps the most we have ever seen on any bridge. We also went up a tower for a bird’s eye view of this magnificent city. A picture is said to be worth a thousand words…here are a few thousand captured in these shots. Sept 15 – Our final stop on the cruise is Amsterdam. When we arrive, we go on a city tour including a canal cruise which is a great introduction to this wonderful capital of the Netherlands. There are many sights to see and do in Amsterdam…the most famous are the Anne Frank House, the historic canals, the flower market, the Red Light District, the Rijksmuseum, the Van Gogh museum and of course, the many cannabis coffee shops. 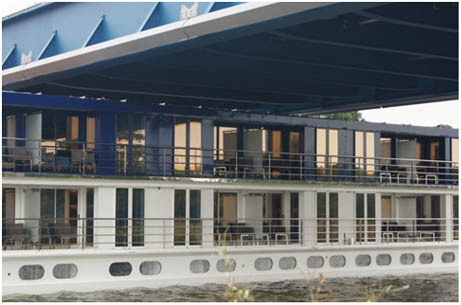 The tour gives us a great canal cruise showing us how the canals are an important part of the Amsterdam landscape. After the tour, we have some free time to wander around and are simply amazed at the number of bicycles in the city. With special bike lanes everywhere and the known fact that bicycles have the right of way in every case, you really have to be careful not to be hit or run over by the thousands upon thousands of bikes in the street. Young, old, professionals, students…everyone rides a bicycle! We stopped by the Flower Market to see the thousands of tulip bulbs for sale along with hundreds of other flower types. Included were Cannabis starter kits. We passed on that kit but we did buy some tulip bulbs which were certified disease and bug free for transport into Canada and the USA…let’s hope they grow next spring! Our final night on the ship and a chance to say goodbye to the many wonderful people we met aboard. This was one of the highlights of the cruise…spending 14 nights with 162 other passengers meant that we had the opportunity to meet, dine and enjoy the sights with almost all of them. Final day on Sept 16 means disembarkation. We have ordered a taxi through the ship to take us to our hotel – Delta City Centre. Here’s the problem. When I looked for a hotel in the city centre of Amsterdam, I had a very difficult time finding any availability due to a large conference in the city. I really wanted something close to the action of Dam Square and the only reasonably priced hotel I could find was the Delta City Centre (not to be confused with the Delta chain in Canada). When I say reasonably priced, this was $275CAD per night. The hotel is rated 3 stars. On our tour yesterday, we happened to drive by the hotel and I pointed it out to Karen. The location was excellent but the hotel looked awful, at least from the exterior. So, on the day of disembarkation, we talked to several people about their post cruise stay and happened to talk to a couple from Colorado who had rented a 2 bedroom apartment. We told them about our doubts about our hotel and arranged with them that if our hotel was as bad as it looked, we could stay with them. As it happened, we shared a taxi with them. Our first stop was the Delta City Centre and we asked the driver to wait for us while we had a quick look at the hotel. The lobby wasn’t too bad but we ran up to see our hotel room. Yikes…the carpet was very dirty and the room was really a 1-2 star quality at best. We cancelled our room forfeiting the first night payment and thankfully and gratefully went with the other couple to their apartment. The apartment was quite a way from the city centre but it was very convenient to the tram. So, we happily traded convenience for cleanliness and safety…we will forever be thankful to Rick and Grace of Colorado for their hospitality and understanding. As mentioned the tram was very convenient and very easy to use. We purchased a 2 day pass for 12 Euro each and off we went to visit the Anne Frank House. We purchased our tickets on line and that saved us from having to wait in the lengthy line ups at the memorial house. The house itself is extremely well presented. If you have read the book, you know the story of the 2 families hiding in the back of the building that housed their father’s business. It was very touching and emotional…I will want to read the book again. I only hope that we can learn from the mistakes of human history and avoid this kind of persecution ever again. We had an amazing supper at a restaurant called Moeder’s (Dutch for Mother’s) and had a wonderful, typically Dutch supper before heading back to the apartment to enjoy some time with our new friends. Tuesday, Sept 16…a full day to enjoy Amsterdam. We decide to take the tram to an area called Jordaan which is a quiet, almost residential area but hear they have some nice shops and restaurants. We literally walked around the area stopping at a coffee shop for a break before touring a houseboat museum. That was extremely interesting because Amsterdam has many, many houseboats of every size and shape in all the canals. In fact, I believe that all the possible berths available are taken. It’s a very interesting lifestyle and we quite enjoyed seeing how some people live on the canals. A pub lunch before heading out to the Van Gogh museum. 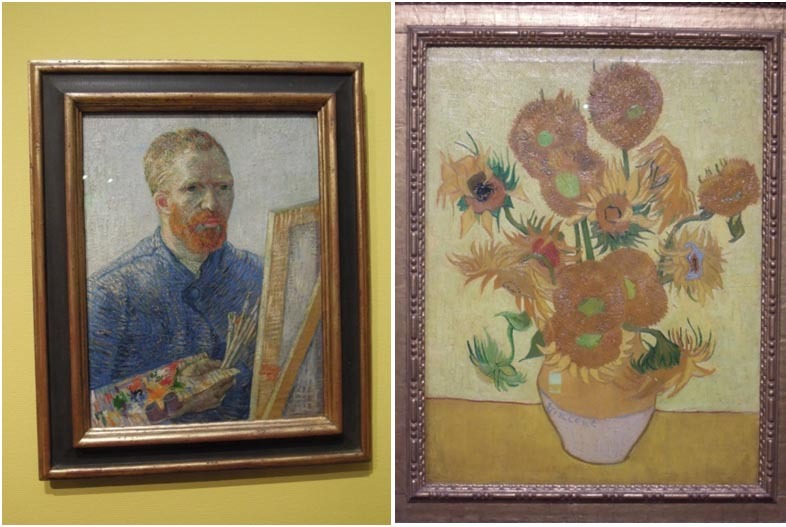 We won’t have time to do both the Rijksmuseum and the Van Gogh, so we opt for the latter. Again, this museum is very well laid out with great exhibits and explanations of his work. The cost is 15Euro each to get in and we opt for the audio tour equipment for another 5 Euro each. We are typically not art museum people…a quick walk through and we are usually done. However, this museum was very interesting and we spent a full 2 hours there, seeing many of his famous works and learning much more about his life and his style of painting. I’m not sure that I am a lover of his work or that I fully understand the genius behind the man but did find it fascinating. We have arranged to meet with Rick and Grace for supper near Dam Square and ended up in La Boca, an Argentine restaurant. There seem to be many Argentine restaurants in the area for some reason but we were very impressed with this one…the food was excellent and the Sangria refreshing after a full day of sightseeing. After supper, one last stop…in the red light district. In yesterday’s tour, the guide said the industry is well regulated with the workers needing to come from and having EU passports. That may be true, but I suspect that many of the workers are forced into the industry in the same way it happens around the world. Anyway, it is quite a tourist area, quite safe and quite a show. Wednesday, Sept 18 – Homeward bound. We had arranged for a taxi to the airport for the early afternoon. Schipol airport is well known for being very efficient and customer friendly. We found it easy to navigate and with lots of shops, you could easily spend a few hours there. We rode in the back of the bus with KLM coming home. The seats were typically close together but acceptable. The entertainment system was with personal TV’s and a wide variety of movies, TV shows, music, games, etc. I found the service and food on board to be very good. Excellent food but not gourmet. Many regional dishes prepared. 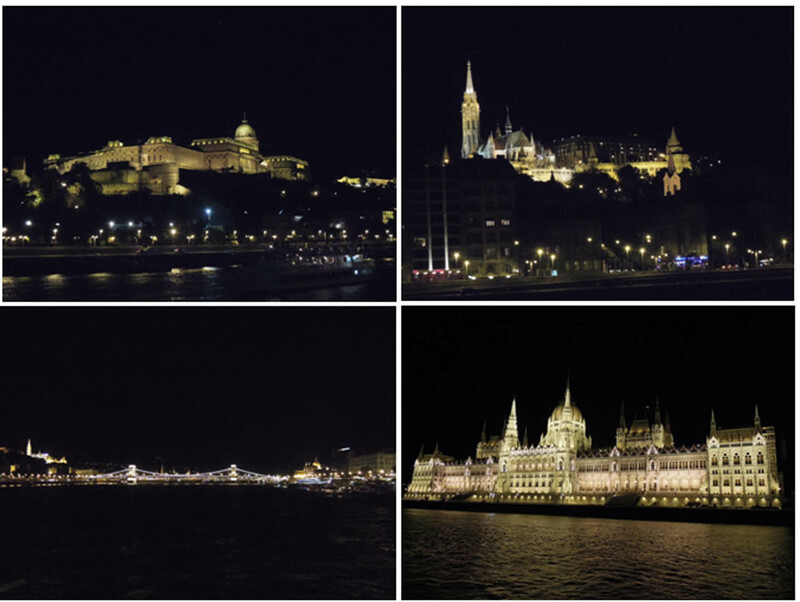 Overall, our first river cruise was an excellent experience and we would go again in a heartbeat. We recommend you put it high in your bucket list. Thanks for following my blog, I hope you enjoyed it! The town of Wertheim, also called “little Heidelberg” because it is such a picturesque village and is located where the Main and the Tauber rivers meet. 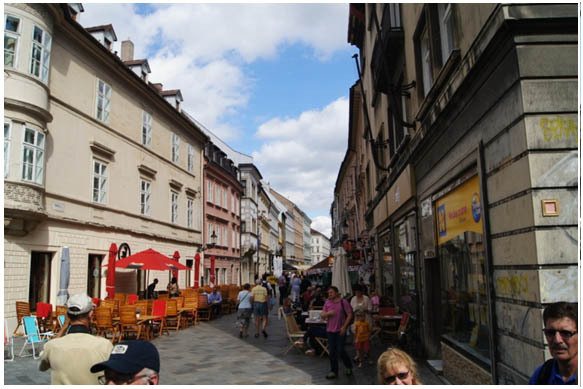 The very centre of the town is the Marketplatz or Market Square with lovely cafes and shops including Bon-Apart, the glass blowing store…the narrow little building in the pictures below, is the store. The town also has a very nice memorial to the Jews of the town that were persecuted during the war. These are called “stumbling blocks” with names of local residents that died in the concentration camps. These blocks are placed on the road in front of what was once then, their homes. In addition, there is a memorial in town too. Back on the boat for yet another delicious lunch. The chef really tries to provide locally themed food so we don’t feel the need to necessarily eat “on shore”, although we have enjoyed some local specialties just to capture the flavour of the area. The town of Miltenberg has been described as the very essence of Medieval Germany. The town almost appears to be stuck in time, with its charming half-timbered houses…almost like a fairy tale. The main street is lined with quaint shops, cafes and vendors. The streets are expectantly cobbled and there are many buildings made from the striking red stone that is quarried nearby. The guided tours that are complimentary on the cruise have been very good with great depth in the history and culture of each village or town that we visit…it really does provide extra value when considering river cruises. They are typically divided into active walkers, regular walkers and gentle walkers so that everyone can enjoy the tour at their pace. We like the active group best because the others are just too slow plus it gives us extra time in each place to explore on our own. Tuesday, Sept 10 was to be a very special day although not without its problems. This is the day that we had arranged to meet with some of our relatives here in Germany. The plan was that some of them would pick us up in Bamberg, we would spend the day sightseeing and visiting with them there and then we would all drive to Schweinfurt to have supper with my cousin, his girlfriend and his kids, which is where he lives. The boat was to sail up the river to Schweinfurt in the evening and we were going to board the AmaCerto that night. Perfect itinerary to get to see everyone! 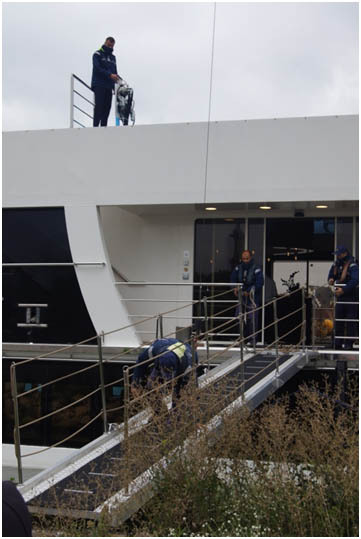 Unfortunately the lock masters have decided to go on a temporary strike that day and we had no idea when the boat was leaving Bamberg and if and when it would dock in Schweinfurt (there are several locks it needs to go through to get there). So…my aunt, my cousin and her husband drive the 2.5 hours to get to Bamberg and we have a wonderful day with them (so great to see them again). We have contacted the ship during the day however, and it seems that the ship will be leaving Bamberg at 6:30PM and not getting to Schweinfurt until the next morning if the lock masters halt their strike. There go our supper plans! Instead my cousin and his son race to Bamberg after work so they can at least see us for a short time. A glass of beer and we race to the boat to arrive 10 minutes before sailing. At least we got to see all of our relatives in the area. We had a wonderful send off from them! 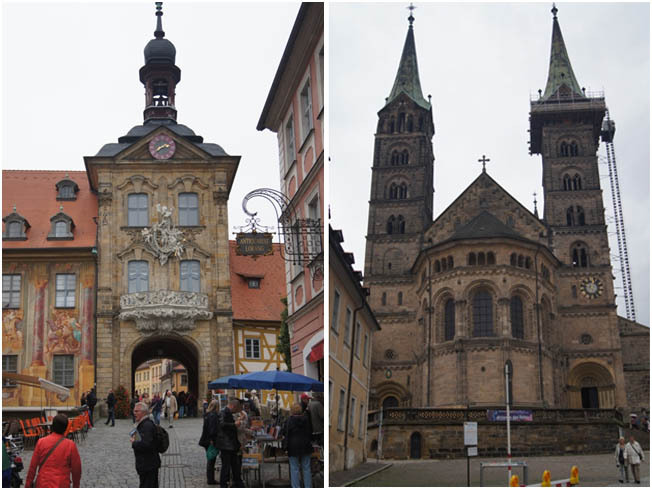 Bamberg itself is a marvellous medieval town, best known perhaps for 2 things. The Rathaus (city hall) is built out over the river (see below) and for its “smoked” beer(someone described it as liquid bacon). I actually quite liked it although one glass is probably enough. It is a beautiful walking town with beautiful churches and historic buildings, in fact one of our favourite romantic towns in Europe. The captain sails our ship to the first lock where we have to wait in line with others ships in the hope the lock masters will again let the river traffic through. At midnight they start the process and indeed we get to Schweinfurt in the morning. As you will read ahead, it does screw up the timetable of our cruise for the next day but the ship has been absolutely marvelous at making adjustments given this unexpected wildcat strike. 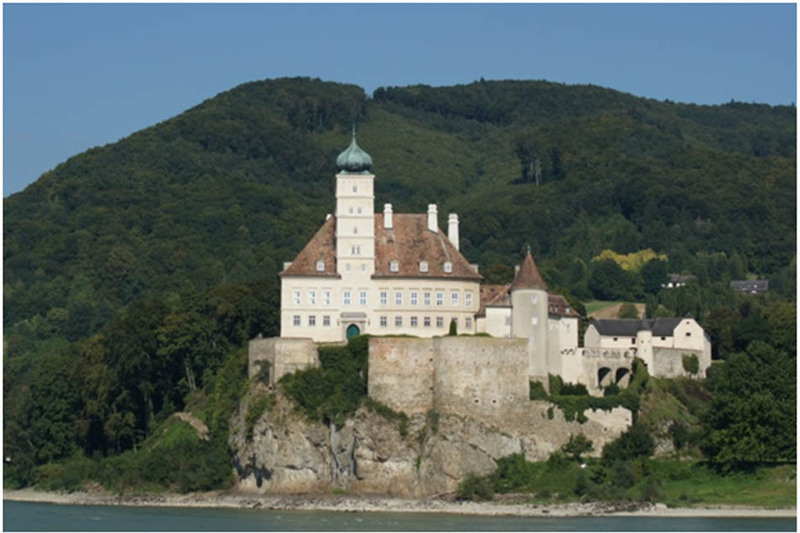 Wednesday, Sept 11 was supposed to be an easy day of cruising with a couple of relaxing stops in Kitzingen and Wurzburg. However, with the strike, we only got to Schweinfurt this morning, so instead of sailing on to Kitzingen, we all loaded onto motor coaches and drove there to take a walking tour of Kitzingen. The ship would continue sailing and catch up with us there. The town is nice but not spectacular but they made up for it with a very nice wine tasting in the cellars of an old monastery. Hard to fit that many people in so it was a bit crowded but the wine was pretty good at the price point of 8 – 10 Euro per bottle. Back to the ship for lunch before we are bussed off again to Wurzburg. The ship actually picked us up along the riverbank which is highly unusual but because of the strike and where we were at the time, this was the only place possible. There was an optional tour to Rothenburg instead of Wurzburg but since we had been there a couple times in the past, we opted for Wurzburg. Having said that, we highly recommend Rothenburg as a destination that is not to be missed. The town centre is very nice and they have a bridge across the river that overlooks the old fortress and some beautiful vineyards. It is a very civilized place since you can buy a glass of wine and stroll along the bridge (closed to cars) or stand at one of the tables and take in the spectacular views. Even though a bit cooler with some periods of light rain, it is one of those moments to remember and hope to return to share it with some of our friends. The ship finally catches up with us and we are now finally back on schedule. Kudos to the captain and the entire crew for making a great effort to keep everyone happy! Leaving Austria behind today, although some people are opting for a full day tour of Salzburg. We didn’t want to take the 2 hour motor coach trip but from what everyone told us…it was well worth the extra effort. Instead we opted to stay aboard and enjoy the almost full day of sailing aboard the ship. Weather has been very nice and so sitting on the sundeck with a good book and my camera for any photo opportunities seemed like a good thing to do. We also had a bridge tour that was fascinating…who knew the draught on the boat was only 4-5 feet? Welcome to Germany! The going is quite slow as there are many, many locks along the way. We end up in Passau a little bit late but we had opted for a bike tour from Passau to Walhalla Temple. 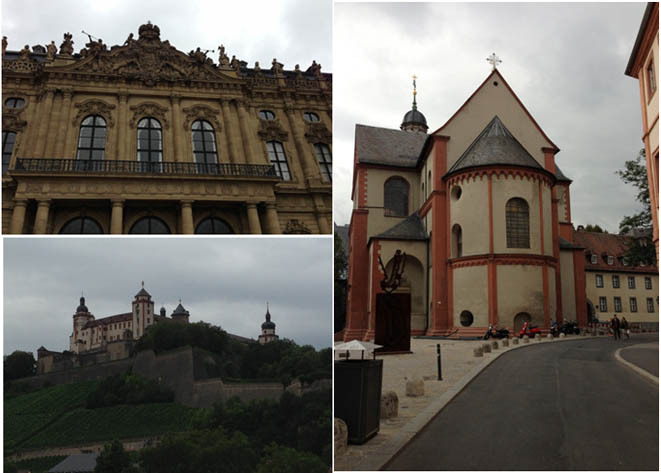 This bike ride was 25 km to a huge museum built by King Ludwig I to honour distinguished Germans throughout history. Of course the biggest statue is of King Ludwig I himself but contains other prominent names such as Goethe, Einstein, Brahmes and many others. It is a beautiful building and well worth the visit…other than the 450 or so steps to the top! Actually, it was great to get some exercise for a change but boy those bike seats get uncomfortable by the end of 50km! The entertainment tonight was a couple of women singing opera to the theme of Sounds of Austria…can’t say it was all that great. Day 9 was another easy day of sailing in the man-made Main-Danube canal which connects the two rivers, until we reached the historical city of Nuremberg. By now we have gone through many, many locks and it is amazing to see how they lower the wheel house and all of the umbrellas and railings to pass beneath some of the low locks and bridges. 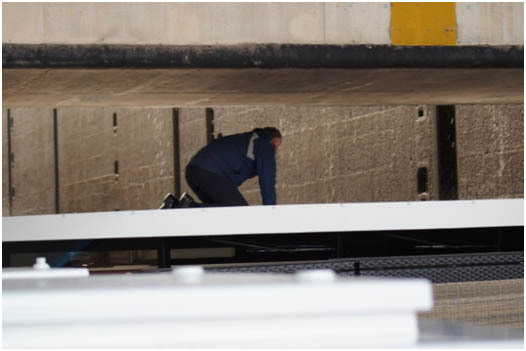 This is a picture of the Captain getting back into the lowered wheel house as we pass underneath of a low bridge. Many will remember Nuremberg as the location of Courtroom 600 where the most famous trials of Nazi criminals was held. In fact, one of the tours available is called the World War II tour. 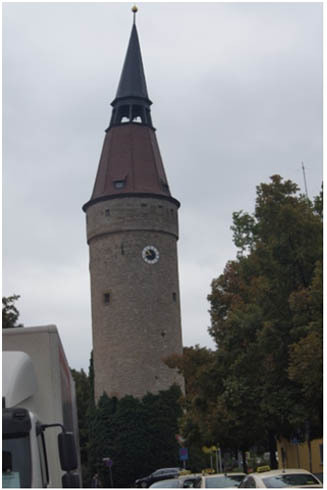 However, Nuremberg was in the medieval days, one of the most important and greatest centres of trade in Europe. 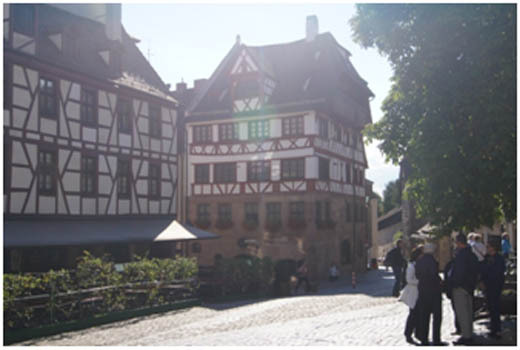 We opted for a tour called Medieval Nuremberg and we were guided around the old part of the city including the very impressive castle and the city wall, along with historical buildings such as the house of medieval artist Albrecht Durer, a renegade in his time. These tours are typically on about an hour or so long, so we always have time for some wandering around to see the sights or do any shopping. I have to say that we did quite enjoy the city and wished we had the time to absorb more the history of it. 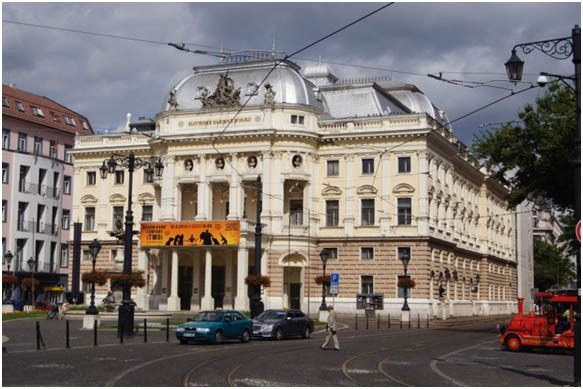 Vienna – The City of Music! 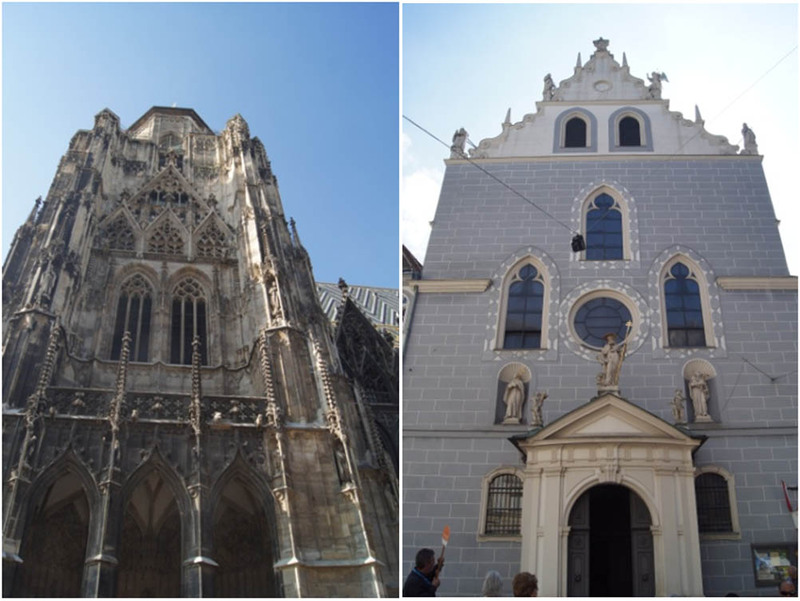 We opted for a tour today called the Culturally Curious Hidden Vienna tour. 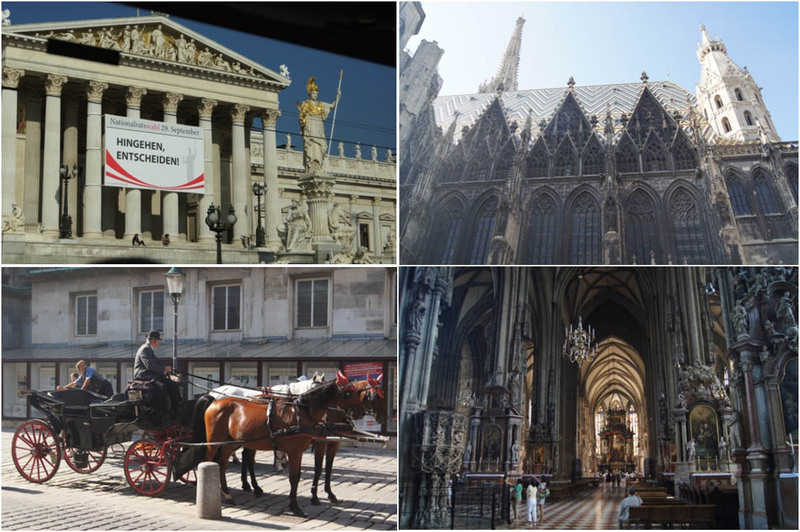 The tour included a motorcoach tour of some of the many sights to see in Vienna, particularly around Ring Strasse. Wow, the architectural is amazing with many beautiful buildings, statues and parks! My biggest regret is not having the ability to stop the bus, get out and walk around some of these areas. However, this was followed by a stop at St Stephen’s Cathedral where we had a chance to learn about its history and could both walk around it and enter the church…it never ceases to amaze me how spectacular these churches are. The Hidden Vienna tour was OK with some interesting sights but truly I would rather have gone to see some of the other main tourist sites. It did cause me to want to come back to Vienna for a longer visit though. Some pictures of the sites are shown below. 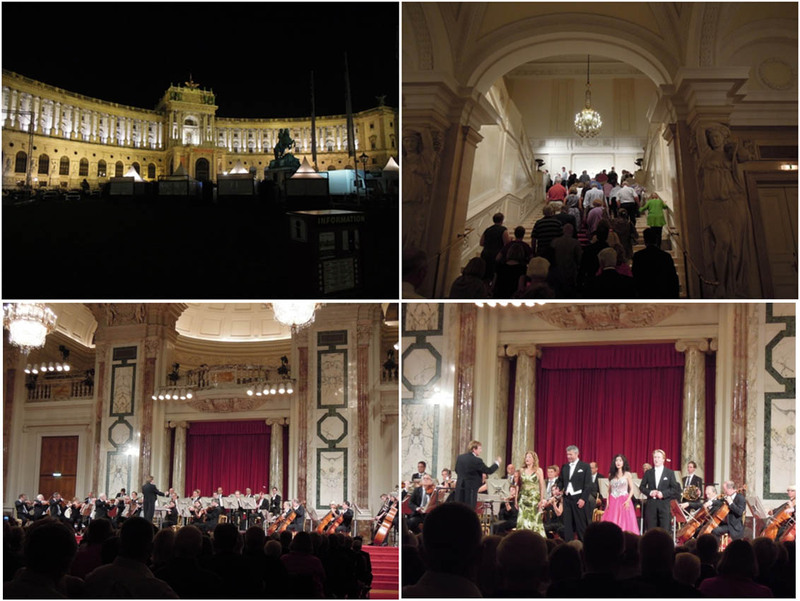 In the evening we attended a Mozart and Strauss concert in the Hofburg Palace presented by the Hofburg Orchestra. This was a beautiful venue and the concert was extremely good. I was very pleased to hear the Blue Danube Waltz played in Vienna in this magnificent facility. This was an optional tour at a cost of 59 Euro each which is a bit pricey, but if you like classical music at all and want to experience it in the City of Music, it is well worth the price of admission. Bonus…we got a free CD! 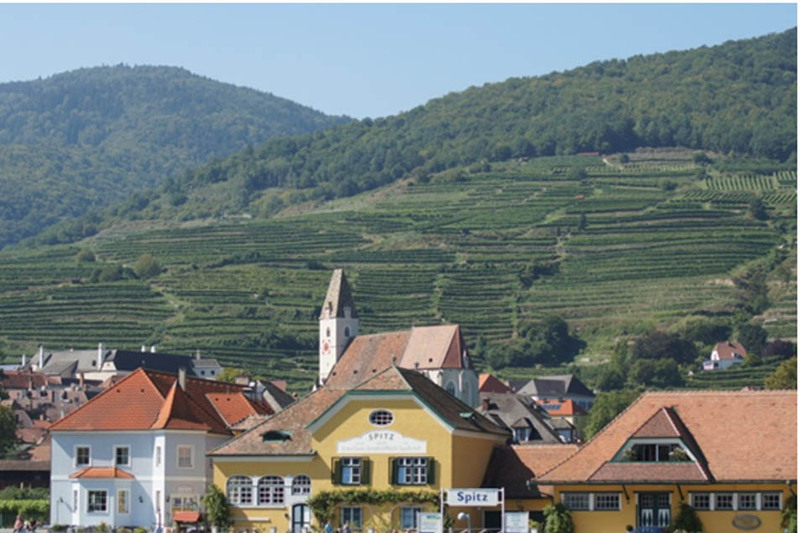 Leaving the big cities behind, we entered the picturesque countryside of Austria with our first stop in Durnstein. 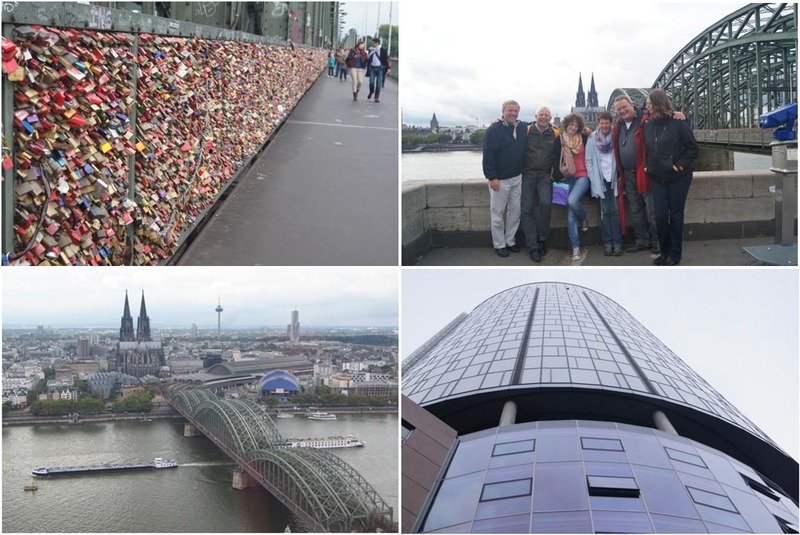 We had a fabulous walking tour…and this is what I really like about river cruising because you simply walk off the ship and you are in the town. 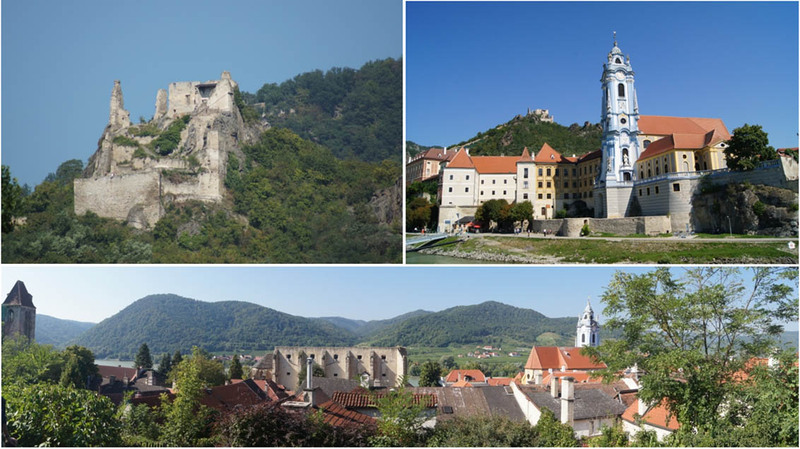 Durnstein is known for the ruins of a castle in which Richard the Lionheart was imprisoned for a time, but more importantly, this is very much a fairytale type of town with charming streets and lovely buildings including the beautiful blue facade of the monastic church. The guide here was fantastic, both very knowledge and very engaging. This is a town that we could spend a couple of days at purely for it’s charm and beauty. The tour ended with a wonderful wine tasting of local wines… Gruner Veltliner, Reisling and Zweigelt…yum! The afternoon was spent cruising the Danube River through the Wachau Valley, one of the most beautiful and famous regions in Austria. The weather was spectacular and they served us some traditional Austrian pastry and wine spritzer as we lazily enjoyed all the sights in the valley. 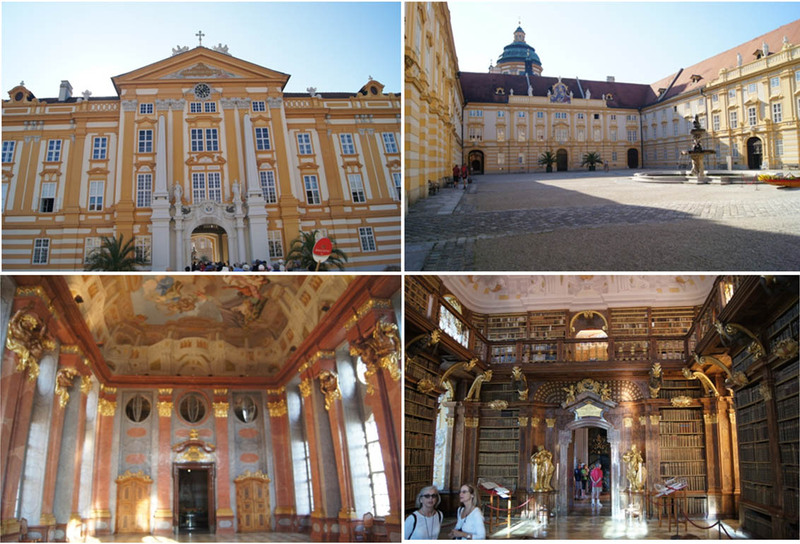 We arrived in Melk about 4 PM and were whisked away to see the Melk Benedictine Abbey. 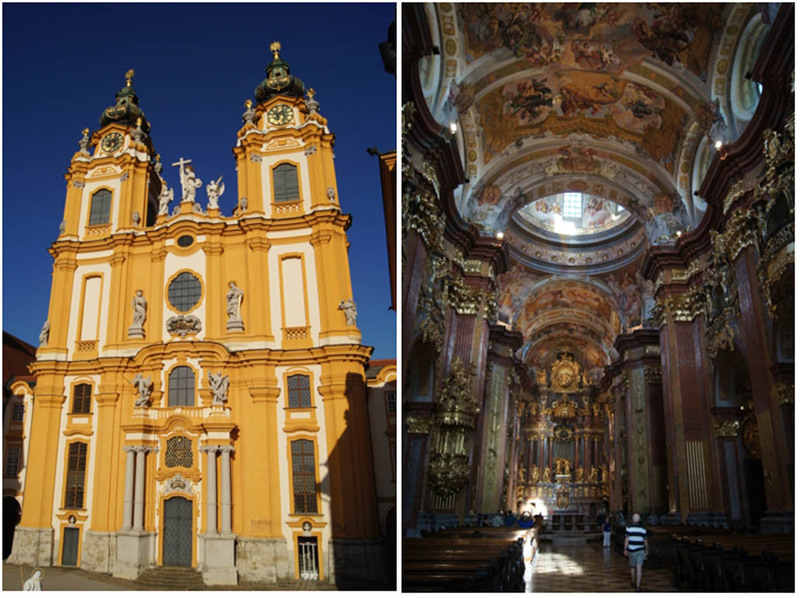 This is one of Europe’s largest and most revered Baroque monasteries. Originally founded in the 11th century is a must see attraction in the area with an amazing church and a very impressive library. 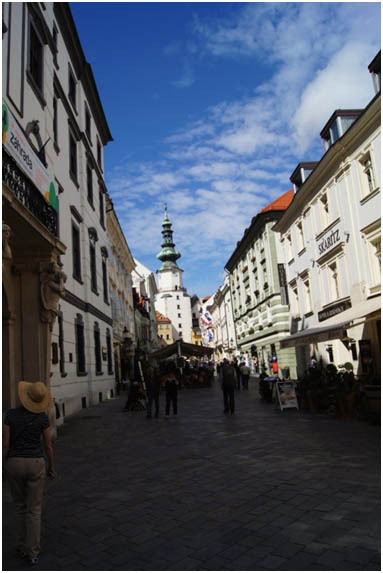 Don’t know what to expect in Bratislava as it is not top of mind as a tourist destination. First impression…it is quite impressive. Somehow I thought that former communist countries would all be dull grey in colour with no personality at all. The good news is that while there are certainly some buildings like that built during the communist period, most of the old buildings and most of the beautiful churches are all pretty well preserved. I’m not sure I would put Bratislava on my bucket list, but we were very happy that it was part of our river cruise adventure! First, let’s cover off getting from Toronto to Budapest. In my entire career in the travel industry, I had never flown KLM but they had a very attractive fare to Budapest, so I was anxious to give them a shot. They allowed us to check in and print boarding passes 30 hours prior to departure and we discovered the cost to upgrade to Business class for the overnight sector to Amsterdam was $390 each. So, we bit the bullet and upgraded because of the lay flat seats and that we could get some sleep on the flight. The service on board was very good and the in-flight crew was great. The entertainment system was excellent and I laughed my way through Hangover III before getting some sleep. The lay flat beds were nice but the seat was never horizontal and was at about 30 degrees which meant I felt like I was slipping down all the time. None the less, 2 or 3 hours of sleep was much appreciated. A 4.5 hour layover before our 2 hour flight to Budapest…more sleep on the flight and ready to go when we landed. The taxi ride was 25 Euro to where the AmaCerto was docked. We arrived at about 1:00PM but they would not check us in until 3:00 PM. 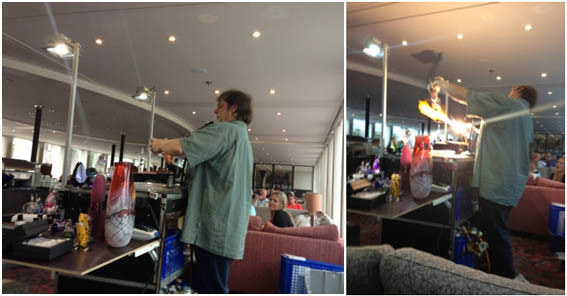 They did open the lounge to all passengers and provided us with food and beverages until they were ready to welcome us to our cabins. So our cabin…was very nice, albeit very small. Surprisingly, there was enough room for all our stuff and we don’t travel light! See pictures below. Anyway, it’s our home for the next 2 weeks and we will enjoy it, I’m sure. The balance of the day is used exploring the boat and having welcome cocktails and a very nice dinner. It’s open seating and we are put with a lovely couple from Texas. Great food and wine (which is included with lunch and dinner), but feeling the effects of our jetlag, we call it an early night. Day 2 is for exploring Budapest and we opt in for a city tour. I had no idea how beautiful Budapest is. Made up of 2 former towns (Buda and Pest), the city is divided by the Danube River. 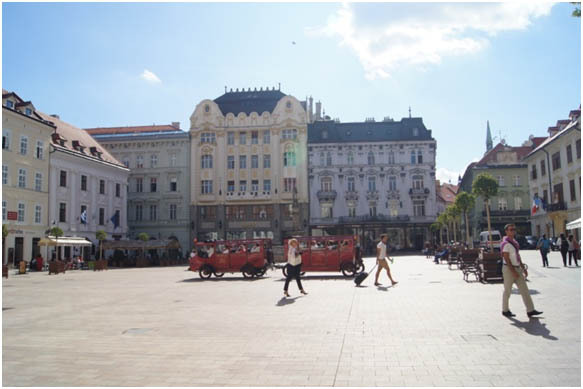 The Pest side is the larger of the 2 sides and has more of the cultural feel of the city. 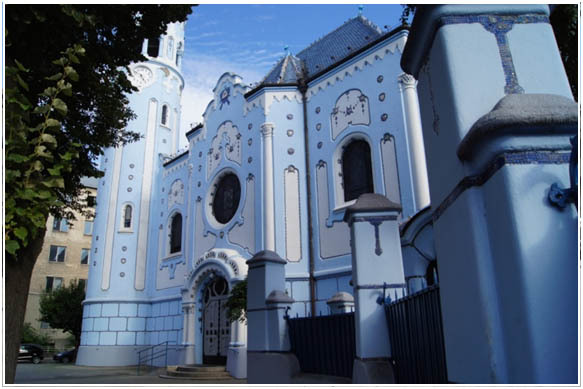 Our tour takes us by the Jewish Synagogue, Heroes Square and the Basilica of St Stephen among other sites in the Pest side and up to the castle district and Fisherman’s Bastion for an excellent view of the city on the Buda side. The tour also provided some shopping time at the Market Hall which had hundreds of food and merchandise stalls, reminiscent of the Grand Bazaar in Istanbul but not nearly as large. The things to buy here? Paprika, paprika, paprika…everyone sells it! They also have lots of embroidery and porcelain.